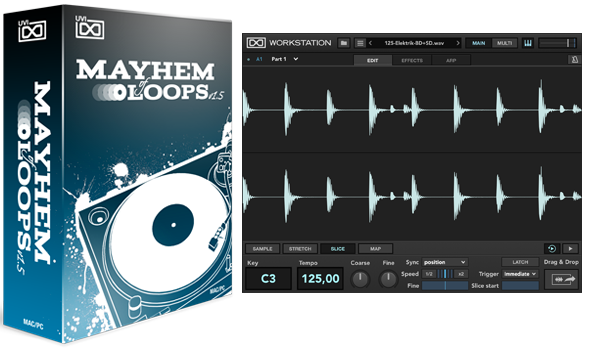 Mayhem of Loops 1.5 delivers a massive collection of high-quality, professionally treated samples including over 8,000 loops covering dozens of musical instruments, playing techniques and genres. From crisp and modern to dirty underground vibes, drums, breakbeats, solo instruments, effect loops, vocal cuts, all ready to play or be stretched, sliced and molded into new forms. 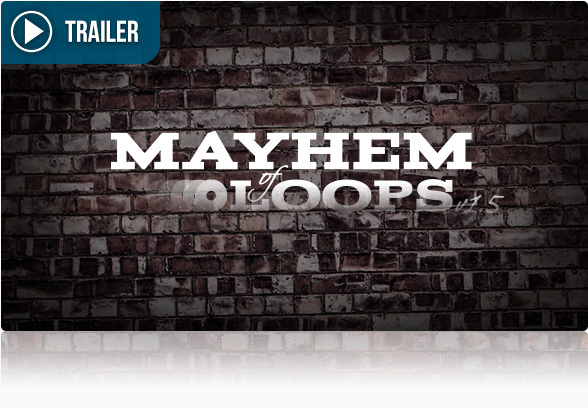 Mayhem of Loops provides a huge arsenal of tempo-synced material for producers in a convenient and affordable package. 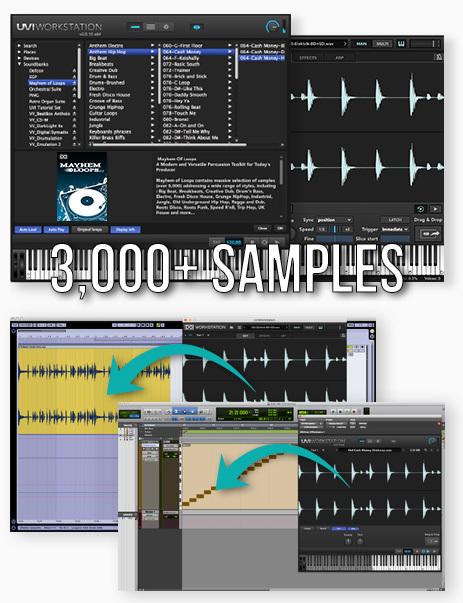 Mayhem of Loops has been enhanced with an additional 3,000+ samples. Perfectly trimmed and mastered to perfection these loops sound amazing straight-away but can be easily manipulated and twisted to taste. With UVI Workstation you can effortlessly stretch loops, map slices, layer sounds and add effects (nearly 50 available, including delays, reverbs, dynamics, saturators, beat repeat and vinyl effects). Drag-and-drop slices as MIDI into your DAW, or drag the wav files to your DAW for further editing (even stretched audio, if enabled). All loops stay in tune and synced to host tempo thanks extensive meta tagging and UVI Workstations high-quality realtime time-stretching algorithms. 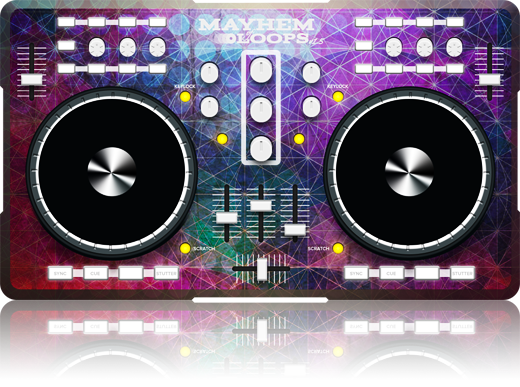 Mayhem of Loops includes a comprehensive selection of sounds covering genres such as: Blues, Hip-Hop, Electro, House, Drum'n'Bass, Trip Hop, Big Beat, Breakbeat, Creative Dub, Fresh Disco House, Grunge Hip-Hop, Industrial, Jungle, Underground Hip-Hop, Ragga, Dub, Roots Disco, Roots Funk, Speed R&B, UK House and more. Whether you're looking for something specific or just inspiration, Mayhem of Loops gives you a huge archive of sounds to explore in a creative and easy-to-use environment. Covering a wide number of playing techniques and music styles including pop, rock, funk, jazz, latin, soul and R&B. All samples tagged with tempo and key for convenience. A huge selection of fluidly played grooves perfect for trip hop, jazz or latin. Covers a wide range of speeds and styles from soft ambient to rippingly fast phrases. Upbeat grooves, twangy hometown vibes, lush 12-string chords, rock and jazz riffs, arpeggios and more await. Covers a wide range of styles on both acoustic and electric guitars. A collection of sweet grooves, riffs and phrases masterfully played and recorded on electric piano, acoustic piano and clavinet. Expertly played and pristinely recorded brass loops add a touch of class to your production. Includes Saxophone, Baritone Sax, Trombone, Trumpet, Brass Hits, Horn Sections and more. The deep and soulful sound of vintage blues resonate across this collection of riffs, licks, phrases and transitions. Covers a variety of playing styles and tones. A brand new selection of drum loops covering several styles of electronic music. Take advantage of full mixes or easily mix and match stems to create thousands of combinations. Based on the unique coloration of the Space Echo (RE201) which gave many original dub recordings their unique flavor. An eclectic collection of acoustic, jungle, dub loops and grooves. Dedicated to the classic electro sound. Deep beats, hypnotizing bass lines, spacey arp sequences, evolving sound effects, dry and processed loops, noise fx and more. Explore the true vibes of Ragga and the spacious sounds of Dub with this selection of loops and phrases carefully designed and produced with a specialized outboard rig. The energy of house meets the funk of R&B in this collection of samples inspired by the namesake genre. A ready-to-use library of loops well suited for high-energy and dance music. A brand new selection of drum loops dedicated to the sound of hip-hops. Loops come as both full mixes and individual instrument stems, or slice them and create your own patterns. Inspired by the classic underground hip-hop scene this selection of loops and production kits includes raw beats, lo-fi samples and more, sorted by temp and style, ranging from 88 to >100bpm. Hard and dirty construction kits of drums, guitar and bass produced with serious attitude for that underground hip-hop vibe. Available in full mix and individual stems. Striking themes and expert musicianship can be heard throughout this collection of construction kits. Tagged with tempo and key and available in both full mixes and individual stems. Dedicated to deep and brooding sound of the late '90s UK trip hop scene, this generous selection of drum samples, loops, fx and kits resonate with cold ambience and dark tones. Supersizing the sounds of Big Beat with a huge selection of hybrid-acoustic loops, fills and furious phrases. A lavish spread of sounds including classic samples and all new material. A treasure-trove of breakbeats ready to be sliced, diced, slowed down and warped. A massive collection of samples with the authentic sound of vintage vinyl. A fresh new library of drum'n'bass construction kits. Provided as both full mixes and individual instrument stems. Huge rhythms with a raw DnB edge, produced with a ridiculous outboard rig. Large impacts, metal hits and a wealth of sculpted percussive ambiances mixed tastefully range from crips and driving to spacey. Perfect for dark ambient, electro, industrial and more. Hundreds of jungle loops and breakbeats ranging from 160 to 173 bpm designed by one of Europe's premier jungle producers. Easily slice loops to program your own progressions. Heat it up with Disco House and Latin fire. A selection of modern dance beats, dry and processed loops, spacious sounds and more. Available in both full mixes and individual stems. A selection of drums and instrument samples riding the line between Funk and Groove. Construction kits provide full mixes or individual instrument stems ready to be used in a variety of ways. The classic sound of Roots Disco is alive and grooving in this jamming selection of drum loops, construction kits, bass, strings and guitar. The essential sound of classic '70s dance. Spankin' upbeat or smooth and mellow, either way they're undeniably groovy! This selection of synths, guitars, bass lines and funky beats vibe with the classic sound of '70s funk. Robot voices and vocoded samples made from a variety of influences including Old School Hip-Hop, G-Funk, R&B and even playful sci-fi. Includes a variety of samples, phrases, loops and fx.